The Festival of Lights 2016 was a more concentrated affair in 2016, but it was still a high quality event. Over 40 creations were presented to the people of Lyon and the thousands of tourists that came from all around the world. These creations illuminated the city from 8 – 10 December. This year, the installations were located on the Peninsula and the city centre and the Old Town and, for the very first time, the Roman amphitheatre at Fourvière. See the installations on Lyon’s Festival of Lights official website. The Festival of Lights is key event in the city’s calendar. The 2016 budget is estimated at 2.6 million euros (LyonMag), and the gains from the event are even higher. Private companies take on half the cost and can contribute to the event by loaning equipment, facilities or by volunteering services. In 2014 hotel reservation rates were 83%. Lyon’s illuminations attract tourists from around the world. Restaurants and shops see their customers quadruple during the event. The Festival of Lights 2016 was a great success despite its reduced format. 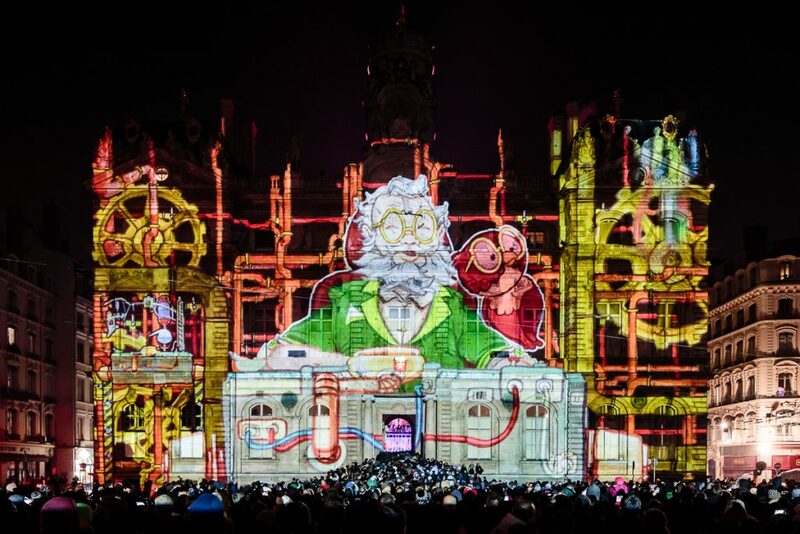 Over 300, 000 people saw the projections at Saint Jean Cathedral and over 720,000 people saw the show Sans Dessus Dessous, projected on Place de Terreaux. Charity candle sales (benefits go to NGO Electricians without Borders) raised 76, 000 euros. Moreover, over 80, 000 people used the interactive map and application (downloaded over 29, 000 times), which enabled them to find their way to the various different installations and events. 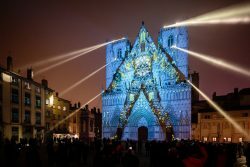 Lyon’s expertise in illumination and urban staging has been exported to Dubai (Lyon acted as Artistic Director in 2014), Leipzig, Moscow and Birmingham. In 2017, from 23 February to 11 March, the city of Montreal will honour Lyon during the 17th edition of ‘Montréal en Lumière’, which, this year, will celebrate 375 years since the founding of Montreal.